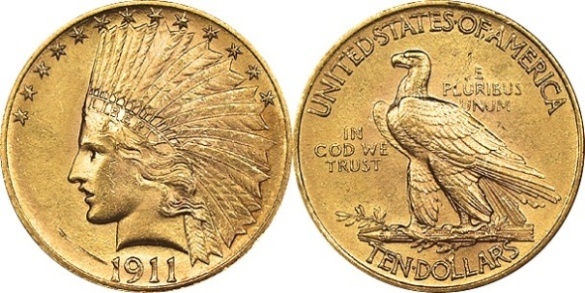 Ten Dollar Gold Eagle Coins were the foundation for gold US coins when the United States first created its monetary system. 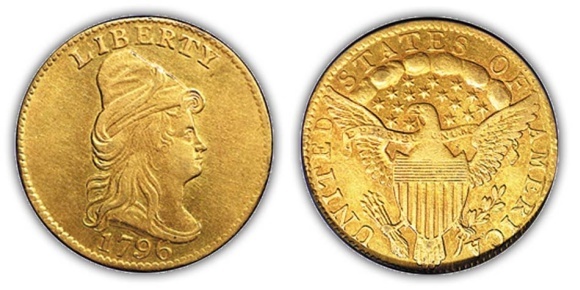 In other words, other gold US coins were to be either fractional or multiple versions of the $10 Gold Eagle. The half eagle was actually the first gold coin made by the United States Mint however, with the eagle following just a couple of months later. Both were released in 1795. Follow the links below for more information and images of Gold Eagle Coins. 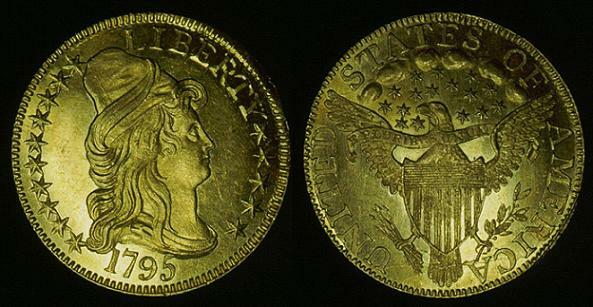 The Quarter Eagle is a gold US coin with a denomination of $2.50 authorized by the Act of April 2, 1792. It was produced by the U.S. Mint from 1796 to 1929. 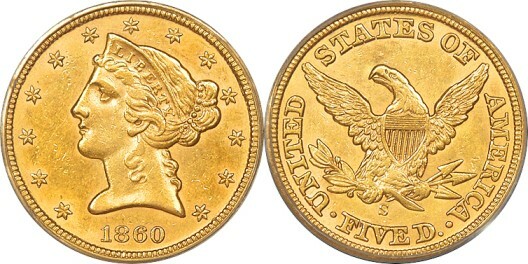 While it played an important role in the U.S. monetary system throughout its production, mintage numbers of this denomination of gold eagle coins were fairly small making quite a few dates in this series rare. For images and more information about the Quarter Eagle go here. A monetary system in which paper notes are backed by pre-set, fixed quantities of gold..
Half Eagles are 5 dollar gold coins produced by the United States Mint. They were authorized by the Act of April 2, 1792. 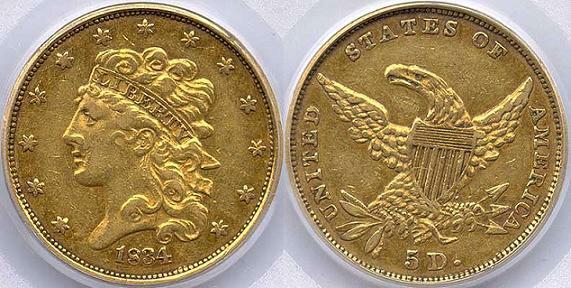 The half eagle was the first gold coin minted by the United States Mint and was produced from 1795 to 1929. 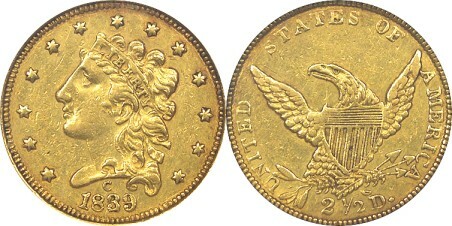 Half Eagles with dates before 1807 are not marked with their value. If you consider $5 commemoratives and gold bullion coins which have been made at West Point since 1986 and 1994 respectively, the $5 gold eagle coin becomes the only United States denomination that was made at all eight mints. For images and more information about the Half Eagle go here. 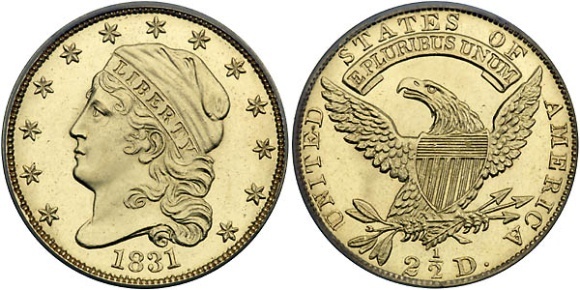 Note: The 1822 half eagle 5 dollar gold coin is one of the most valuable regular-issue United States coins. 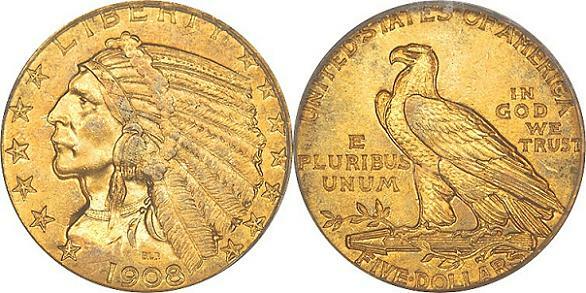 Gold Eagle Coins are $10 Gold US Coins that were authorized by the Act of April 2, 1792. They were produced by the United States Mint from 1795 to 1933, except for the years 1805 to 1837. 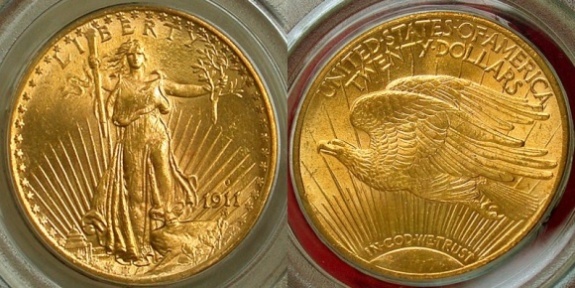 The first coins were released to the public a couple of months after the gold half eagles. For images and more information about the Gold Eagle go here. 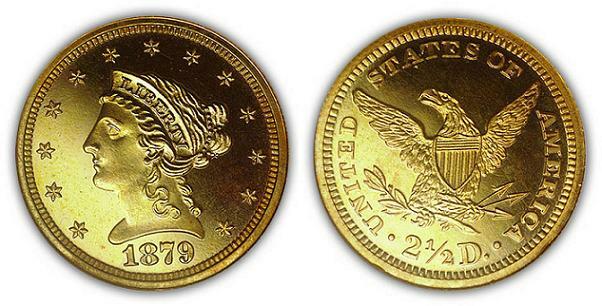 The Double Eagle gold coin is a United States 20 dollar gold coin authorized by the Act of March 3, 1849. This term when used in coin collecting describes a prototype of a proposed coin design. coin in 1849. This single, unique coin is now on display in Washington D.C., at the Smithsonian Institution. The first coin produced for general circulation was made in 1850. The discovery of gold in California made it possible for the United States Mint to acquire enough gold to produce these large, heavy coins. 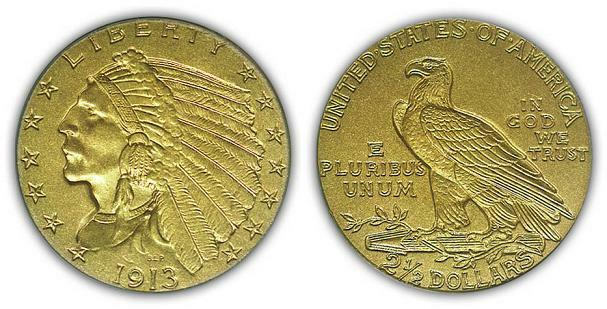 For images and more information about the Gold Double Eagle go here.